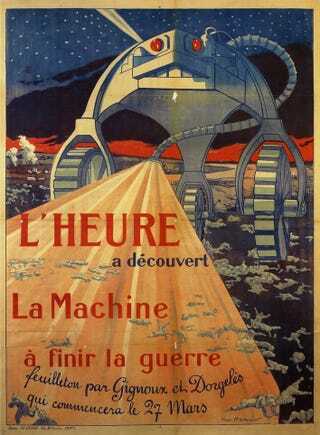 A 1917 poster by French artist Henri Montassier offers hope for a quick conclusion to the war through new technology. But, his image has little in common with the armored vehicles under development. Instead, he unveiled a weapon that bears an uncanny resemblance to the Martian war machines from The War of The Worlds. Under a star-filled sky, the three-wheeled machine (top) moves unopposed across No Man's Land, firing a deadly beam that strikes down fleeing German soldiers. Dozens of bodies litter the ground in its wake. (By 1917, The War of the Worlds had been published in France, including a 1906 edition illustrated by Henrrique Alves Corrêa, left). Meanwhile, in the real world, a new invention, the "tank," was quickly taken up by the French who produced a number of successful designs, such as the Model 1917 Renault, which figured prominently in the Allied offensives of 1918.